 Weltweit Agri-Exports LLP is a reputed Exporter and Supplier of an array of Agricultural Products. Our wide range of Agricultural Products comprises of Spices, Food Grains, Vegetables, Groundnut Kernels, Sesame Seeds, Wheat Flour, and Salt. Our products are known for their quality and high nutrition content. We are sourcing high quality products from our suppliers those who are using state of art testing technologies. We specialise in the variety of products of the highest order at an affordable cost. Our aim is to keep walking on the road with success by delivering superior quality products and excellent services to our valuable customer through our sincere customer services. Till date we have exported to Singapore, Malaysia, Thailand, Sri Lanka, Indonesia, Japan, Italy, Jordan, Bahrain, Congo, Nigeria, Turkey and Ukraine and keep growing to other part of the world in a safe and high-grade packaging. Located in Mumbai, Maharashtra, the company was established in the year 2010. Under the headship of Mr. Ritesh Mehta and Mr. Dipesh Shah, the company is growing in leaps and bounds since its establishment and has positioned itself as a renowned name in the market. Our mission is to be the leader with a clear business focus at each business level & with heightened sensitivity to customersâ��needs, setting new standards in the delivery and quality services through processes of continuous learning and improvement. Knowledge, commitment, trust of customers and professionalism are not just words but the principles that comprise our identity, which once implanted in the market place, will allow us to become an essential part of our customerâ��s value chain. We have garnered a huge number of clients into this growing and competitive industry. Now, with our strategic management, we have attained a large clientele across many countries. We ensure timely and safe delivery of fresh products within the given timeframe. The unmatched quality of the products and prompt delivery of the commodities to the clients maintaining the international quality standards has helped the company to gain high market share even in this competitive age. The company is assisted by well qualified staff managing the production, finance, marketing departments of the company. It is their combined and well co-ordinated efforts that have made the Company a success - a force to reckon with, the world over. The world of Spice & Rice has changed over the last decade from a flavour industry to an industry also requiring a detailed understanding of the product profiles of developed markets. This includes understanding of physical, microbiological and toxic profiles of the food products along with conformation to the regulations of advanced markets in Europe and the USA. We provide the premium quality with Prompt Delivery.